The first twenty in the term “20/20” is how many feet you are from the eye chart. In most eye doctor offices that eye chart is 20 feet away from you. The second twenty is the size of the lettering. So 20/20 means that the average (see, there’s that word again) person should be able to see a 20-size letter from 20 feet away. What if you have horrible vision – 20/200? 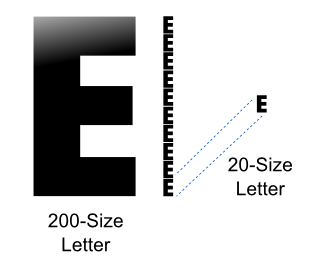 That means that the letter your able to barely make out sitting in the exam chair has to be 10 times (200 is 10 times larger than the 20-size letter) larger for you to tell what letter it is (see figure 1). The goal of most eye doctors is to correct your vision to only 20/20. However, this is quickly becoming an old standard. In prior years we could only correct four eye problems with conventional glasses – nearsightedness, farsightedness, astigmatism, and prism. These are called low-order aberrations. This left smaller visual distortions uncorrected, called high-order aberrations. It’s these distortions that result in “fuzzy” vision. 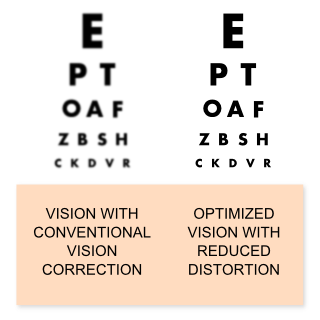 This is why some patients can still read the 20/20 line, but the vision is still “off” (see figure 2 – left side). Additionally, you may see halos, glare, or starbursts around lights at night if you have these distortions. The recent availability of high-tech instruments make it possible for your doctor to measure your visual potential to an unprecedented level of accuracy. The most recent technology can be found in the i.Profiler instrument by Zeiss, which optimizes the vision not only for daytime but also nighttime. Combine that with digital eyeglass lenses and we often see people achieve enhanced vision that goes beyond 20/20 (see figure 2 – right side). Many people obtain 20/15, which can be categorized as excellent vision. A small percent of people can even see 20/10, which is the human limit of vision! If your doctor can’t get your vision corrected to at least 20/20 that means some other issue is holding back your vision. The most common reasons are dry eyes and cataracts. If you have either of these or another vision-disturbing condition, digital lenses may not be of much benefit over conventional lenses. So ask your doctor if digital lenses are right for you. Many people have compared their experience with digital lenses as being like buying their first HDTV. They can’t imagine going back to watching standard definition TV. At your next eye exam, talk to your doctor about digital lenses and leave your average vision behind.